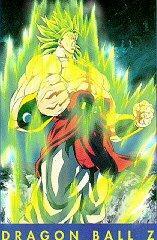 Brolli is the legendary super-saiyan. He was born on the same day as Goku. Goku made him cry and Brolli wants em' dead just for that. Brolli is finally destroyed by Trunks and Goten. His father is Paragus.